Laptops have come a long way since the PC went compact - a very long way. With the market featuring countless brands and an infinite selection of laptops that are built for everything from productivity to gaming to simply surfing the web, it can be a daunting task picking one that’s right for you. This is where Taiwanese electronics giant, Asus, comes to your rescue. Asus may not be the biggest fish in the ocean, but it certainly has been making some waves due to its sleek designs and a line of laptops that cater to your every need and meet you at your specific price point. Ready to Go Shopping for an Asus Laptop? It may not be a MacBook, but it definitely is capable of offering you what Apple can, only at more affordable prices. Are you game for an Asus laptop? Great! Let’s take a look at 5 great Asus laptops that you should consider in 2018. These are machines that have been designed to give you the best - performance wise, aesthetically, and of course, a sweet deal that won’t burn a big hole in your pocket. As mentioned, laptops come in all configurations, built for all sorts of uses. When looking for a laptop, you need to look for one that is specced to give you the best performance for the dominant type of tasks you will be using it for. Although many are configured to blur the line between the tasks they are predominantly built for, a number of models have been optimized to excel in certain areas. Others are even built to cut production costs so as to offer you an affordable laptop that is capable of delivering when it comes to functionality. And because of that, we will be looking at the best Asus laptop for each category of use. This will help you pick the best Asus laptop for your needs. Let’s jump right to it then. Not everyone has the money to splurge on a high-end laptop. But that doesn’t mean you should settle for a laptop mediocre laptop. You should go for an Asus VivoBook Max. One reason ASUS is making waves in the consumer laptop market is that makes some pretty affordable but highly functional and reliable machines – such as the subject of our current discussion. The Asus VivoBook Max is a beautiful laptop, so much so you wouldn’t believe it’s a budget laptop. Although it comes with a plastic chassis, it looks like a metal casing from a distance. This is because the lid and the keyboard surround are made to look like brushed aluminum. Upon opening the lid, the Asus VivoBook Max greets you with its brilliant 15.6-inch HD LED 1366 x 769 display. The screen is pretty impressive considering the VivoBook Max is a budget laptop. You’ll also find a full-sized Chiclet keyboard and trackpad, both decent enough to satisfy the casual user, but nothing to write home about either. For processing power, the Asus VivoBook Max comes with an Intel Pentium N4200 Quad-Core processor at 1.1 GHz with 2M cache (2.5 GHz overclocked) and 4GB DDR3L RAM. 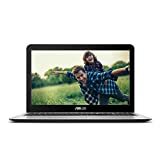 For a laptop in its class, these are very good specs that will help you complete most of your basic tasks such as word processing, web surfing, and even HD video streaming. Overall, this is a great productivity laptop for students and basic office work as it can easily multi-task and has ample storage in the form of a 500GB hard disk drive. And with a weight of 2.2 pounds, it easily makes for a laptop you can throw in your backpack so that you can do a bit of work on your commute. One surprise music lovers will find pleasant is that the Asus VivoBook Max, despite its 1.1-inch slim profile, comes with an impressive set of Bang & Olufsen ICE power audio speakers. These are superior quality speakers that will afford you a great listening experience as you work. 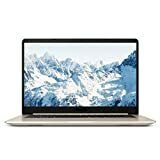 If you are looking for a budget laptop, this is definitely the laptop you have to opt for as it gives you more than you pay for. Ready to get your productive juices flowing? We all know that productivity is directly related to the performance of the equipment you use. And if most of your work is done on a laptop, then the tool for you is the Asus Pro P25440UA-AB51. One thing you’ll immediately notice about this Asus laptop is that it looks executive and ready for business with its brushed black body. Under the hood, you’ll find an excellent 15.6-inch FHD display with anti-glare properties. As for the engine that will drive your productivity, the Asus Pro P2540UA-AB51 comes with a very fast 7th-generation Intel Core i5 processor, 8GB of RAM and 1TB of 5400RPM HDD. This is the perfect combination for a productivity powerhouse. The Asus Pro is one laptop that is certainly a strong contender to upset the Lenovo Thinkpad in the best business laptop category. Sporting a lightweight profile, solid connectivity, and a very ergonomic keyboard, this is one laptop you’ll certainly enjoy working from, no matter the duration of your project. One thing you’ll appreciate about the Asus P-Series is that it takes security seriously. One noteworthy point that proves that is the inclusion of a fingerprint reader on the device. As for battery life, the Asus Pro comes with an excellent battery that will last 9 hours and 13 minutes, allowing you to polish up your presentation mid-flight. The Asus P-Series is definitely a good choice if you are looking for a business laptop as it is configured to compete with some of the best in the category, yet at half the price. If this sounds like the best laptop for you, then you need to be prepared to part with $750 – $800. Now, that’s real value for money. If you’re more into the pleasure side of laptops than the business side, you’ll definitely love the Asus ROG Zephyrus. This is not just the best Asus laptop dedicated to gaming, but it certainly ranks among the best gaming laptops on the market. Before you picture a behemoth of a laptop that you have to lug around if you want to move with it, stop right there. The Asus ROG is a gaming laptop with many differences that set it apart from many other gaming laptops, and one of those differences is its thin profile. In fact, it is one of the thinnest and lightest gaming laptops on the market. What makes the ROG Zephyrus unique is the game-changing Nvidia Max-Q technology that helps power this gaming rig. Max-Q is a powerful technology that helps gaming laptops become more efficient, thereby reducing energy lost in creating heat. This ultimately means the Asus ROG Zephyrus runs cooler than most gaming laptops and thus uses smaller fans, thus the thinner profile. And because of the Max-Q, the Asus ROG Zephyrus is able to run powerful GPUs like the Nvidia GTX 1080, that would otherwise run the risk of overheating. The Asus ROG Zephyrus is really a game changer when it comes to the way gaming laptops are designed, and the power they can carry. From the outside, the Asus ROG Zephyrus may look like a fancy ultrabook, but don’t be fooled by its diminutive size (when placed next to other conventional gaming laptops). This is one case that really proves that dynamite does come in small packages. Let’s just take a look at what this gaming laptop has to offer. Although you can get the Asus ROG Zephyrus in different configurations, I would suggest you get a model with a 7th generation Intel Core i7 processor clocked at 2.8GHz, 16GB of RAM, and a 512GB SSD. As for the GPU, it’ll definitely come with the top of the range Nvidia GeForce GTX 1080 with the innovative Max-Q Design and 8GB of VRAM. You’ll definitely be hard pressed to find a gaming laptop of this caliber. This is one gaming laptop that was definitely designed to blow you away with its superb performance and graphics. The only disappointment with the Asus ROG Zephyrus is the battery that will only last you a little over 2-hours. But given that it is the one component that is literally overworked in the system, we can cut it some slack – as we wait for Asus to come up with a better solution. For such gaming power, you’d expect Asus to price this rig in the stratosphere as with other powerful gaming laptops, but no. 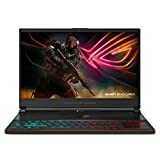 The Asus ROG Zephyrus retails from $1,950.00 to $2000. For a gaming laptop of its caliber, that is pretty cheap. If you are looking for a great laptop for your content creation but don’t want to spend on a MacBook Pro, the Asus VivoBook S 510 is exactly the laptop for you. From the casing to the screen to performance, this is one laptop that was designed to impress. You certainly won’t feel out of place sitting in a room full of Mac users. When you open the lid, you will immediately be hit by the 0.3-inch NanoEdge bezel that gives it an 80% screen to body ratio. When you put it next to other laptops, it makes them look like dinosaurs. The screen itself is a 15.6-inch full HD display that will easily afford you a 178-degree viewing angle. And if you are a creative, you know there are many instances where you’ll have to do some work on the fly. This is where you’ll appreciate the slim 0.7 profile and 3.7-pound weight. For the heavy video editing software that you use on a daily basis, the Asus VivoBook S 510 will easily take them in stride with its Intel Core i7 processor 8GB of DDR4 RAM, and 128GB M.2 SSD + 1TB HDD. And for those late night projects, the ergonomic keyboard is backlit, making it easy to beat looming deadlines. With this machine at your fingertips, you definitely won’t envy Mac users – it will give you excellent performance at a fraction of the cost. The ASUS F556 takes the cup for overall best Asus laptop for one reason – it has the perfect combination of beauty, power, and price. The first thing that will strike you is its icicle-gold metallic frame and its impressively portable size – it measures 15 x 10.1 x 1 inches. You’ll then be impressed by the 15.6-inch full HD display that features a blue light filter, which makes reading easier on your eyes as it diminishes blue light levels by up to 33 percent. For superior performance, the Asus F556 packs a 7th-generation Intel Core i5 processor, a 256GB solid-state drive, and 8GB of DDR4 RAM. This will allow you fast boot up times and easy multi-tasking without suffering from any lag. When it comes to connectivity, the Asus F556 has one of the best configurations you can find on a laptop with USB 3.0 Type-C, HDMI, and VGA ports, a 3-in-1 card reader and much more. The Asus F556 comes with an advanced Li-Polymer battery that is capable of delivering up to 700 charge cycles, more than twice what you get from a Li-ion battery. 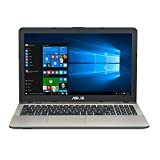 For the best overall Asus laptop, you’ll have to budget $650.00 to $700. Money well spent if I may say so. 9.9" x 15" x 1.1"
10.1" x 15" x 0.9"
15.6" x 10.3" x 0.7"
10.1" x 15" x 1"
With this fine list of the best Asus laptops, I’m sure you’ve probably found the best Asus laptop for yourself. These are all brilliant machines that will certainly provide you with great value for money. And if you are looking for a laptop that is more specifically suited to your needs, Asus probably has what you are looking for. Their product line is so wide it accommodates everyone. Go ahead, you can never go wrong with an Asus Laptop. Previous articleChromebook vs Tablet – What Are the Pros and Cons of Each?